Aquilegia atrata is a beautiful free flowering species that is native to the alpine meadows and forest clearings of Switzerland and Northern Europe. 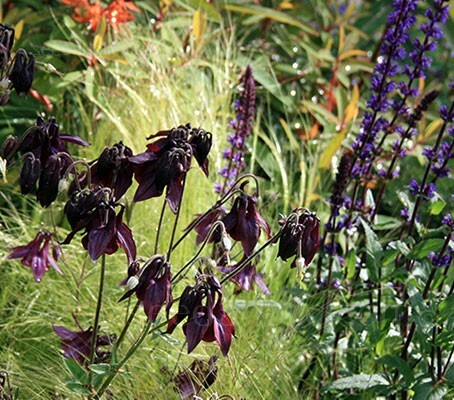 With many branching stems of deepest coloured, almost black flowers. This is an outstanding, highly sought species that would be a showstopper in any spring garden. Blooming in late spring and early summer, the wiry stems which carry up to ten blooms grow to around 60cm (24in) tall above a rosette of crow's-foot leaves. Dead-head spent flower heads to keep flower production going, or leave them on to turn into seed. 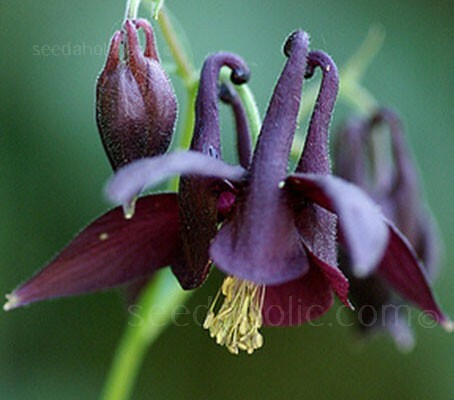 Perfect for rich soils in sun or part shade, Aquilegia atrata grows in the clearings of mountain forests in its native habitat, so it likes rich, humusy soil. It looks equally at home in a cottage-style scheme, among grasses, or dotted through a perennial border. It is hardy to minus 30°C (-20°F) and self sown seedlings left to grow where they germinate are extremely drought-resistant. Aquilegia atrata can be grown in harsh climates and further north, where its blooming period might be more restricted to May and June. Columbines in the wild are identified by species characteristics and often are endemic to a specific geographic area. There are at least seventy species of Aquilegia, including Britain’s native Aquilegia vulgaris. Aquilegia vulgaris has been grown in gardens since the 13th century, when it first appears in illuminated manuscripts. Aquilegia alpina is a European native of the Swiss Alps and Northern Apennines and is found usually at 1500 to 2500m. The true plant is not often seen in cultivation, its place being frequently taken by a form or hybrid of A. vulgaris. The species name atrata means dark or blackish. 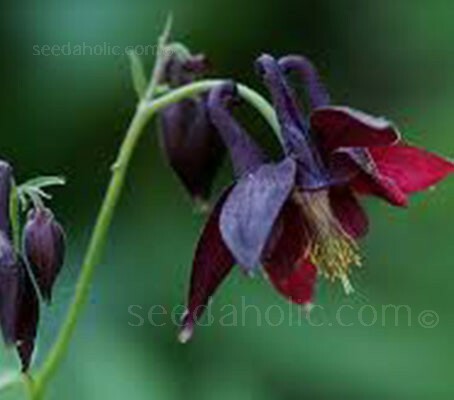 It has the common name of The Dark Columbine. Another common name, columbine, comes from the Latin columbinus, meaning 'dove-like'. If you up-end an aquilegia to reveal the spurs, they resemble birds feeding and 'Doves round a Dish', another common name, reflects this perfectly. The flower was often depicted in medieval paintings to represent the dove of peace.